We got to the ferry port just on time to check in at 7:20 and were soon on our way, and three hours (and a bit of sea-sickness) later, we arrived on the South Island ready for a new adventure. We drove west to a place called Motueka and stayed in a Top 10 Holiday park for a bit of luxury (and the ability to do some laundry). 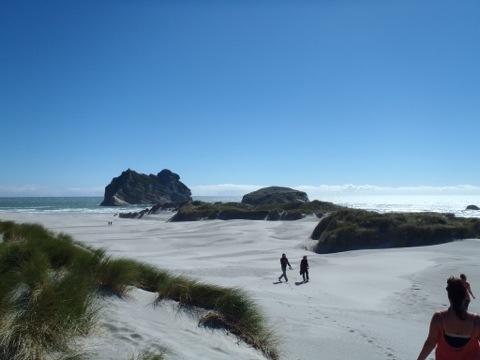 The next day we drove north to the Golden Bay, visiting Wharariki Beach, a huge stretch of wild and blustery sand and sea, and then Pupu Springs on the way back down south, with the clearest water I think I’ve ever seen. That night we stayed at one of the DOC sites on Lake Rotoroa. We continued on south and on the way went to Bullers Gorge swing bridge…possibly one of the scariest bridges I’ve ever walked over (it was really high!). 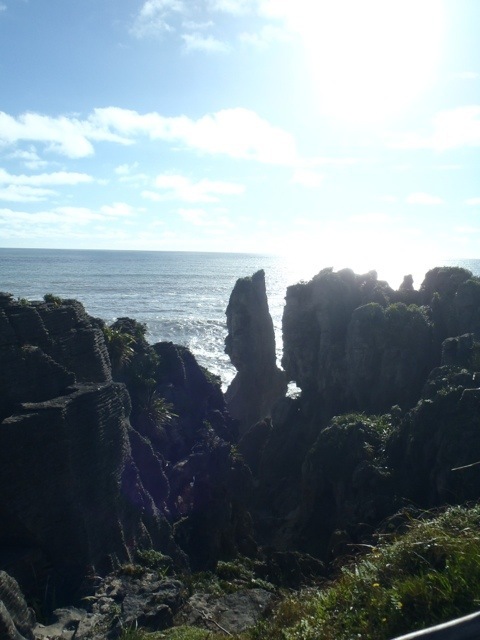 Then it was on to a place called Punakaiki, where we saw the pancake rocks and the blowhole…the water comes spurting up out of the rocks every few minutes. 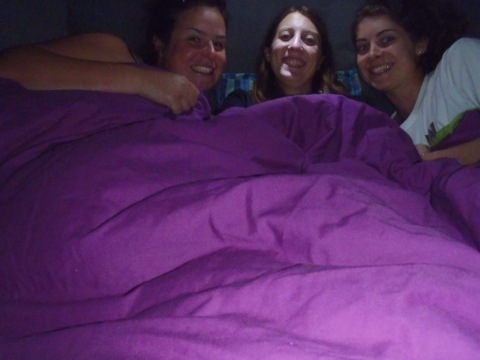 We got back in the van after this and drove down to Hokitika and stayed at a DOC site on Lake Kaniere for the night. We drove to Franz Josef the next day, but only after visiting the Hokitika Gorge and then the I-Site in Hokitika to book our Glacier walk. We arrived in Franz Josef in the early afternoon and had a wander around before finding a place to stay…the Rainforest Retreat Motor Camp (definitely a place to note if you’re ever in the area). The next day was one I’d been looking forward to for a while. Rachel and I headed to the Franz Josef Glacier Guide office at midday and soon enough we were all kitted up with our boots and raincoats and crampons, ready for the ice. 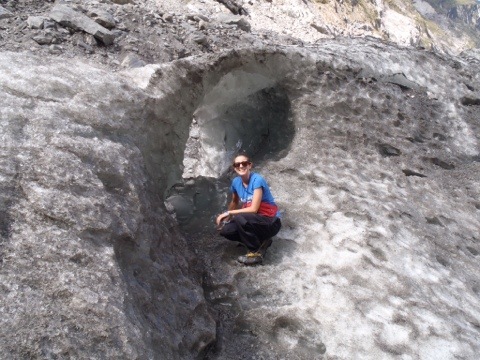 We walked for about 4 hours, first across the rocky area leading up to the glacier and then on the ice itself. With our guide Remi leading the way, we ventured all over the ice, down and up and down again, using our crampons to keep ourselves steady on the slippery surface. 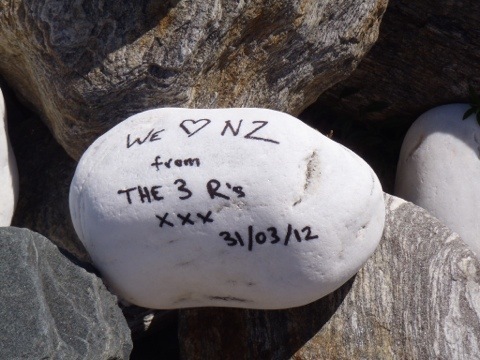 It was incredible afternoon, and certainly lived up to expectations…definitely a top thing to do on the South Island. After all the excitement of the previous day, we had a pretty chilled time the next day…we drop to Lake Matheson to do a short loop walk around the beautiful lake, before driving on to Haast and then Wanaka where we stayed at Lakeview Holiday Park. That night we decided to treat ourselves and went out for dinner…Rachel and myself thoroughly enjoying our meals of steak and Thai chicken curry, with Rosa regretting her choice of bacon and scallops almost immediately (she wasn’t sure she even liked them in the first place…oh Rosa!). The next morning, after dropping Rachel off at church, Rosa and I headed into town to search for free wifi in any of the cafes. We were unsuccessful though, so had to bite the bullet and pay for it (it had been a while since we’d had Internet and, let’s face it, we were missing Facebook) while chilling with our coffees. Rachel found us at about 1pm and we ventured to the I-Site to book our Milford Sound cruise for a few days time. Then it was back in the van and on to Queenstown, a place I’d definitely been looking forward to, thanks to all the bigging-up it had received from fellow travellers. 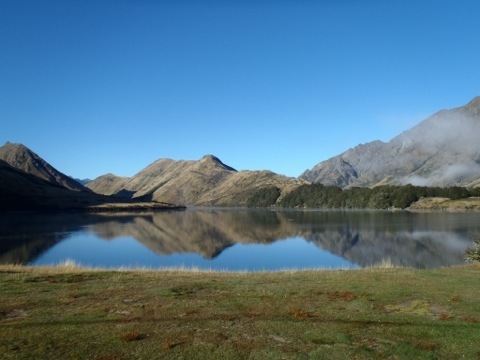 That night we stayed at another DOC site, on the stunning Moke Lake, about 10km west of the city. We woke up absolutely freezing cold, surrounded by mist in the valley. After warming up a little bit, we headed into town to find some Internet and sort some things out. We’d come to the conclusion that we’re not going to have enough time on the South Island, as we’ll be spending two entire days driving all the way back up to Auckland, so we decided to drop our van off in Christchurch and then fly back to Auckland instead. We spent the morning sorting all this out and then drove to Te Anau, about halfway between Queenstown and Milford Sound, and stayed in a holiday park for the night (as we needed power to charge our cameras). The next day we headed north from Te Anau, up the Milford Road to a DOC site (infested with sandflies and bumble bees) about an hour’s drive away from Milford Sound itself…exciting cruise stories coming soon!